Warwickgrad.net is an online space for University of Warwick students past and present to network, share professional experience and to benefit from the insight of the Warwick alumni community. Over 19,000 alumni, students and staff from all over the world are part of the Warwickgrad network, of which over 1,500 are available as mentors. Samir Farrag, originally from Norway, studied Politics and International Studies as an international student at the University of Warwick, graduating in 2008. After graduation, he worked in corporate customer service back in Norway, before returning to the UK to do a Masters in Violence, Conflict and Development at the School of Oriental and African Studies, University of London, following which he then completed a 6 month fundraising internship at the U.N. refugee agency in London. 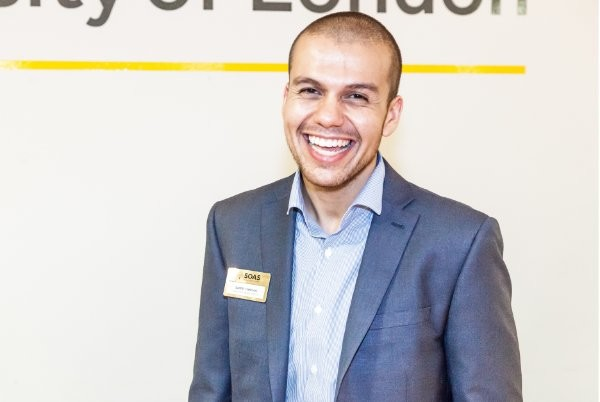 Samir went on to work in alumni relations, university partnerships and international engagement for London Business School, SOAS and now at King’s College London. What were your expectations before you actually signed up be a mentor? I have had a lot of managers that were sort of mentors but before this, I’d never been in a formal mentoring relationship either as a mentor or a mentee. I was really happy to see that Warwick had set up a fully-fledged mentoring platform. It was easy to sign up and sign in, and because you could link with LinkedIn, that was very helpful. When I first signed up to be a mentor, I initially thought I was only willing to support mentees via email, maybe a Skype call. However I found that once someone messaged me, I realised I was happy to meet face-to-face and be much more involved in a mentoring relationship. I wanted to support students and give back because I know there have been a lot of things I have learnt along the way that definitely would have been valuable for me to have known when I was a student. I wasn’t quite sure if I could be such a fountain of knowledge but it was a very positive experience once it started. Tell us about your first mentoring request that you received? It was really good. I was quite keen to get involved and it was a couple of months before I got a message from my first mentee. She was in Italy at the time and she messaged me because of my experience at the U.N. Refugee Agency, as she was very interested in refugees and forced migration. She had just finished a Masters at Warwick and was thinking about transitioning from one career to a different one. So she initially just wanted advice and was interested to hear my experience in the charity sector. She was very kind and polite. We had been on multiple emails, then a little bit down the line, she was applying for a job and I have helped her with an application. I shared my CV and gave her some tips on how she might be able to update her CV. So the mentoring relationship went beyond what she initially requested? Yes, initially she approached me around a specific topic of working in the charity sector but I ended up being able to share general career advice, which was useful and was quite rewarding in itself. Often in mentoring, people get very focused on the sector specific information that an individual can give but what I’ve noticed is it can be the more general experience that can be the most useful. How long was your formal relationship with your mentee? I would say, six months. It went from spurts of email conversation, she had lots of questions and we shared dissertations because we were both writing about refugees, and then we met up within 2 or 3 months when she was actually in London. So the system was the way in which your relationship started, but now that the relationship is formally completed on the system, is your relationship still continuing offline? Now it is friendly and we just catch up every so often. I still give her advice, but it’s more chatting! She was moving to the Middle East to pursue a language degree so I gave her some advice about connecting with people. There, she was connecting with some local Warwick alumni ambassadors so that worked out quite well and I suggested that there would a lot of people very eager within the Warwick network itself to connect with and suggested she should check Warwickgrad to see who is from Jordan on there as well. Is there an ideal type of mentee you wanted to be a mentor to? What I’ve noticed is I think you can be useful to an extent to anyone but you need to be very specific about the kind of advice that you can give and at what level. I think there’s more of an ideal approach of a mentee. If they’re willing to listen, ask questions, engage with what is being said and to add to it, then the mentor will be willing to give more and the whole relationship becomes a lot more fruitful. There’s an investment of time on both ends and the relationship is two-way. By the end of it, I actually really appreciated my mentee’s time invested. What do you think you learnt from this experience of being a mentor? I learnt a lot about myself. I was surprised at how much advice I could share. You develop a lot of insight and understand that it’s not ‘one size fits all’ and it is actually easier than often is thought to be able to pursue the things you want to do, even though you might not have a specific background in it. Mentoring uses similar skills that come close to coaching, and it’s positive to see what people find useful. It made me reflect a little bit on my experiences which is always a good thing. I remember thinking a lot less about what was really important when I was searching and looking for jobs If you can find that out as early as possible, it helps you find the roles that will make you the most happy, and if you’re happy in the role you’re in, you’ll probably progress a lot a lot more quickly as well. That was one of the conversations I had with my mentee, not just that she wanted to work in a specific area, but what kind of job, and I could speak to her about that. Another really awesome take away for me specifically with my mentee was that speaking to her rekindled my interest in refugees. I’d always thought about what more I could do with that interest group and I took up a volunteering position with the British Red Cross every two or three weeks as a destitute grant volunteer for their destitute refugee service for half a year. So for me, that was very rewarding as it got me to move onto something like that. Have you also been on Warwickgrad to look for a mentor for yourself? Yes I have, but I have yet to find someone as I am looking for something very specific. Ideally either engagement specialists/consultants or someone working in corporate alumni relations that works for a law form or big bank, as I am curious to find out how they do engagement with a different sort of constituency, their approach with their different objectives and the tools they use. I’m just looking for interesting people. I don’t think location is going to play as big a factor. It could be useful to have a mentor that is local but I think in general, the fact that you can touch base or reach out to individuals in different markets can be very positive. Does it make a difference to you whether your mentor is a Warwick alum? I think the fact that you have shared an experience from a University is definitely a positive one and any angles like that help. It can be more difficult in professional settings because you’re not quite sure if someone would be willing to help you, unless they take an interest or you really strike up a conversation. It’s a little bit harder to cold message people on LinkedIn who might be one step outside of your network. It is possible though and I’m relatively confident enough to do it, but I think other individuals might not be as well versed or happy to do that and so having a connection of some sort is very positive. I think having some form of affinity or connection and something in common is actually quite vital, because it gets your foot through the door and gets the conversation moving. Do you think you would have benefited from some engagement with alumni, when you were at University? I had very little engagement with alumni, but it would definitely have done me well because it is nice to see the career trajectories and understand more about what and how other alumni (beyond the friends you make) go off and do things after graduation. And finally, has your experience with the Warwickgrad network and mentoring changed the way you interact with the University of Warwick? I think you get more involved, you get more information and you understand there is more to it than working with younger graduates and being able to help. I had gone to a couple of events, but I think this is a deeper level of investment and connection. Being able to give back in a very meaningful way comes from things like mentoring. If there are other ways I can help out and give back like giving careers talks, I would definitely be happy to. I also donated to the University after my experience, so there is a positive correlation. be a catalyst for financial gifts. Find out more about the Aluminate platform and eMentoring by contacting us.